Whether you are a new parent or not, you want to protect your baby from top to BOTTOM! Yes, we are talking about your baby's bottom. What better way to protect such a sensitive area than to use a naturally formulated diaper rash cream? We have compiled a review of five creams you may want to consider. Most diaper rash creams contain a skin barrier ingredient, like zinc oxide or lanolin, which creates an impermeable barrier between your baby's bum and wetness. When looking for a diaper cream, you want to know the cream's barrier ingredient, or if there is one at all. Most natural products contain other organic oils that aid in soothing and healing your baby's nappy area. 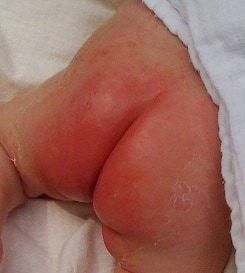 This is the very reason why we chose to review diaper rash creams that are safe and natural. You want to buy a reasonably priced cream that is highly effective but that works within your personal budget. You want to be sure you are going to purchase a product that works effectively in both preventing diaper rashes and treating the ones that may occur. It can feel overwhelming with the number of diaper changes that a baby can require. You want a cream that works best for you. Can you access it quickly while changing a crying baby? Are you able to easily fit your diaper rash cream in your diaper bag? Is the cream packaged in a way that makes using it or cleaning it off messy or difficult? Also, is this a cream that you can pick up in stores or is it something you can only find in limited places. Is it cloth diaper safe? Not all creams are safe for cloth diapers. Parents that cloth diaper need a cream that will protect their baby, but not at the expense of damaging their diapers. Most of the natural creams claim to be safe, but may require that you check with the diaper manufacturer. This smooth and healing cream uses a non-nano pharmaceutical grade zinc-oxide, and fair trade beeswax. Its other key ingredients are the flowers of calendula, camomile, and lavender, creating a soothing and pampering cream. It effectively treats and prevents rashes, and a little goes a long way. It is safe for all skin types and is cloth diaper safe. Its packaging comes in a flip top, squeeze tube, and is small enough to throw in a diaper bag. If you are looking for a less expensive, yet natural cream, this may be a winner. This sweet smelling cream is formulated with 40% zinc oxide and various organic oils. The sweet almond oil does a great job in masking diaper odors. The cream is known to have a fresh powdery feel once it is applied. It is conveniently packaged in a flip top squeeze tube making it easy to both access and carry with you. It is not tested on animals, and is cloth diaper safe. If scent, and convenience and its environmental savviness is something you value, this may be a good choice. Standing out in its floral and pleasant print, the pleasant smell is the first thing to love about this cream. This product does not use zinc as an active ingredient, instead it is formulated with amber petroleum and anhydruous lanolin. Deriving from a Balsam plant of Peru, and Natural Vitamin E makes this cream multifaceted. It can help soothe skin conditions, such as: cradle cap, eczema, rashes, cuts, scrapes, cracked heals, chapped lips, even freshly tattooed skin. It comes in both a squeezable tube or tub. A little of this product goes a long way. It is also safe to use with most cloth diapers. If you want a cream that does more than just help with diaper rashes, is pleasant smelling and convenient, and don't mind spending a little more up front, this may be your favorite. This hypo-allergenic, USDA certified organic cream is able to both prevent and treat severe diaper rash. Its strength is proven to alleviate other symptoms as well, including: hives, eczema, dry/damaged skin, and infant sebborheic dermatitis. It only uses organic oils, powders and oats. This cream does not use zinc or lanolin. It can improve blood circulation and restore pH balance. Very effective in treating severe rashes. It comes in a tub, which is not as convenient as a flip top, and may be a little messier. If you are looking for a 100% all natural product that is known for healing powers, this is your cream. However, if you are looking for convenience and a lower price, this may not be your favorite. This naturally made salve earns a low hazardous rating for being vegan, zinc free and lanolin free. It is formulated with only Shea butter and organic oils. It is ointment free from most allergens.It can also cure a number of common skin problems like: fungal rashes, thrush, cuts, chafing or chapped skin. The small tub may make application a little messy under the nails. It is also cloth diaper approved. If you are looking for salve, versus a thick cream that naturally soothes and is free from most allergens, and can help with various conditions, this may be a great choice. It may not be a good choice for someone who prefers convenience of use, or who would like a stronger barrier cream. After looking at each diaper cream and carefully considering the pros and cons in each of the categories, the Weleda Diaper Care Cream ranks highest on our scale. Its ingredients provide evidence in creating a safe, yet effective barrier in protecting your baby's bottom. We like the high zinc-oxide content and natural non-active ingredients, and its ability to both preventing and treating severe rashes. Its convenient squeeze tube and flip top is a winner for parents on the go. It can be found in most retail stores that carry baby products. Also, not getting the cream under your nails each application is a definite plus. Last, but not least, we love how it is cloth diaper friendly!